I can’t think of Memorial Day without my family being up front and center. We were lucky, every single one of them (nearly two dozen) came home (at least in the most recent wars) — whether it was WWII, Korea, Vietnam, and any of the subsequent wars fought in the Gulf. Great-Uncle Howard landed at Normandy — he was lucky and part of the second wave. His brother Builo came home and enrolled in high school to finish his senior year and graduate when he was 21. These stories are always close to me, as they are the stories I heard over and over growing up. They might not have liked what they had to do, but they went and did it. Never complaining. And yes, they knew how lucky they were to be able to come home when so many they served with were left behind. My father-in-law is buried at Arlington National Cemetery. It’s a stark reminder every time we visit his grave, steps away from Section 60 where there are no admirals or generals, just the men and women who made the ultimate sacrifice for our country. From the Tuskeegee Airmen graves we visit so my son knows their story and importance, to the extraordinary civilians who also gave their lives, including the 184 who died in the 9/11 attacks on the Pentagon and those onboard American Airlines Flight 77. Section 1 holds the Lockerbie Memorial Cairn dedicated to the victims of Pan Am Flight 103. We pay our respects at Section 46 where the comingled remains of the Space Shuttle Challenger is memorialized and I relive the shock and horror of my childhood, watching the explosion on the television in my classroom at Carver Middle School. I have wept at the grave of Medgar Evers and pray that one day, civil rights for everyone will exist and we will all be equals in the eyes of our beholders. Instead of a cookout and celebration, I’ll dust the case holding the flag that sits on top of my bookcase. I’ll think about these people I loved so deeply and I will think about and pray for their comrades who didn’t come home. The debt we owe our fallen heroes is one we can never truly repay. Robert Todd Lincoln, son of Abraham Lincoln, is buried in Section 31. Medgar Evers – Civil-rights leader who was shot outside of his home in Mississippi in June 1963. Glenn Miller — noted composer, arranger, trombonist, and Big Band leader. has been missing in action since Dec. 15, 1944. At his daughter’s request, a stone was placed in Memorial Section H, Number 464-A on Wilson Drive in Arlington National Cemetery in April 1992. Anita Newcomb McGee is buried in Section 1. In 1898, she was the first woman to be appointed as the Acting Assistant Surgeon in the U.S. Army and was in charge of the Army’s nurses under the Army Surgeon General’s Department. She pursued the establishment of a permanent nursing corps, which became the Army Nurse Corps. James Parks is the only person buried in the cemetery who was also born on the property. Parks was a former slave who had worked at the Arlington House and later became a cemetery caretaker, likely burying thousands of service members. He died in 1929 and is buried in Section 15. Joe “Louis” Barrow “The Brown Bomber” – held the title of Heavyweight Champion of the World longer and defended it more times than any other boxer in history. As a sergeant during World War II, he donated $100,000 to Army and Navy relief efforts and fought 96 exhibition matches for more than 2 million troops. (Section 7A, site 172). President William H. Taft is also buried there with his wife, Nellie. Taft was the 27th president of the United States and later served as the nation’s 10th chief justice — the only person to have served in both offices. Mrs. Taft was instrumental in bringing the Japanese Cherry Blossoms to the Tidal Basin in Washington, D.C.
You can’t go home again. Home is where the heart is. Old sayings, yes, but they both ring true. Once you leave your home – y’know, the place you grew up in with the people you grew up with – it’s not there anymore. But if you’re always wanting to be somewhere else, you’re never really home either. Which, makes the trip we had been on kind of interesting. As my wife said, we had been on the road for vacation. Well, I was on vacation in MD while she was at BlogHer in NYC. It has been a few years since I spent any significant amount of time in MD, since most years we prefer to go to the beach. Suffice it to say, this year was different. And it was different for several reasons. One of the biggest reasons this trip was so different was a place that, while being an institution in its own right, was a place I had never been to before: Politics and Prose bookstore. It’s on Connecticut Avenue in Northwest DC, nestled between the Chevy Chase and North Cleveland Park neighborhoods. 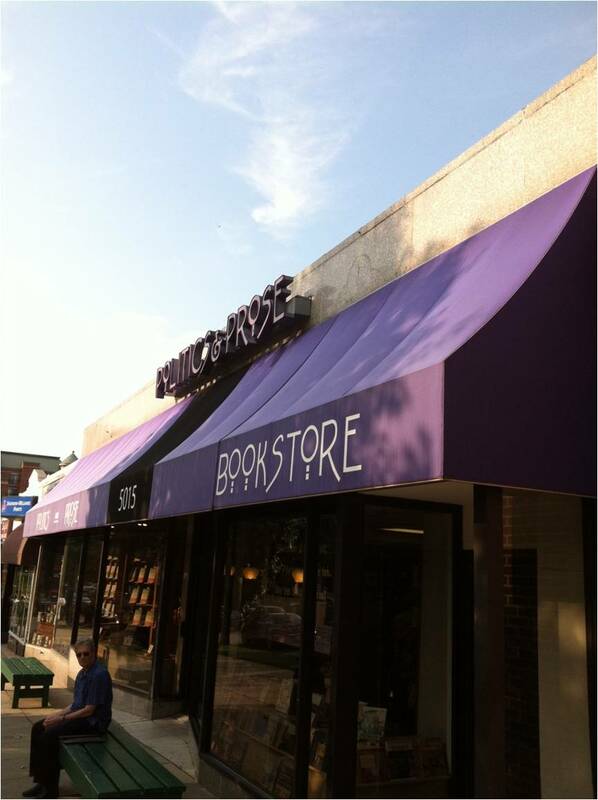 Indeed, as with many of the best independent stores in the country, Politics and Prose thrives first and foremost because of a deep connection to community. Our business is not just selling books but building community. A book can be bought anywhere; community can’t be. P&P’s special ethos must be nurtured and preserved with care, and we’re committed to doing so. But we also will be counting on our loyal customers—and hopefully many new ones—to help sustain the important institution that P&P has become. I think they hit the nail on the head. Vibrancy at the local community level is what we’re talking about here. In this day and age of digitized media, it’s too easy for folks to engage others with, as my wife calls it, “keyboard courage.” Personally I think you can take the “cou” out of “courage” and you get a more apt description for what our discourse has become too often. There really isn’t a lot of community when you’re hurling f-bombs at someone halfway across the world. Try doing that to someone three doors down from you and see how long the two of you can live with the tension. The dynamic changes a lot. But as people and communities try to put things back together after we realized our houses weren’t worth what we thought and true happiness isn’t measured in the number of “Likes” attached to a Facebook status, we have to start somewhere, with something. If we’ve learned anything over the past five years, the old suburban/ex-urban model of living just isn’t all it’s cracked up to be. We’re at a crossroads, this country of ours. We can either try to recapture what was once lost, or build something new. It’s just that in this case, that something new is actually something that’s really old: the antiquated notion that neighborhoods are places you actually live and possibly work in, not just places you commute to and from. Or in Politics and Prose’s case, you go to a bookstore to read, discuss and buy books. Stated simply, this ain’t shopping. Shopping is what you do when you’re looking for a new HD TV. But for books, for reading? I’d think you’d want to take a bit more care there, since you’re talking about true content that you will feed your brain with, not just picking out a device to watch it on. And this is a place where you can do that, especially since using mobile phones in the store is prohibited. An oasis from the modern world of ‘busyness,’ in the heart of one of the busiest cities in the world? Whodathunkit? As for going home again, no a trip down Connecticut Avenue wasn’t enough to make me wish I was back in DC/MD again. It’s going to take at least a few more trips to Politics and Prose to do that. Wordless Wednesday: Stopping in to say Hi! Washington, DC is always a fun adventure for my family. Not only is our nation’s capitol filled with a sense of grandeur and glory but you will find museums galore and unparalleled history. For us, this was not a vacation or weekend of fun, but a trip that was filled with family matters that needed attention and a quick turn around time. A promise was made in July to our son. His birthday wish was to stay in a fancy hotel. We could have booked the Ritz-Carlton, Four Seasons or St. Regis. Our choice was the Westin Grand. It’s located in the West End of DC in a quiet residential neighborhood. With both Georgetown and Dupont Circle close by, there was plenty to see and do nearby, but we weren’t in the middle of the hustle and bustle. 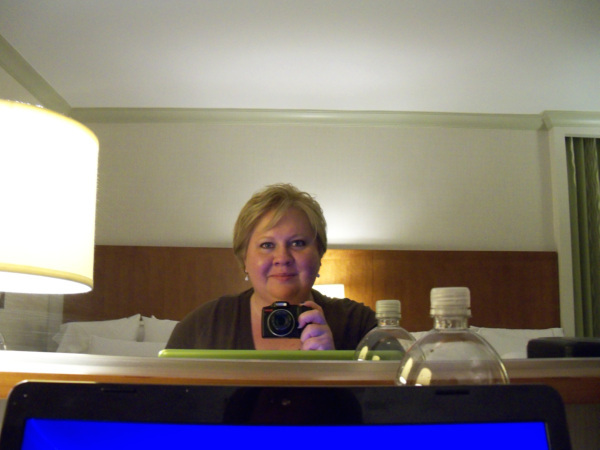 It was perfect for an abbreviated trip where much needed downtime was sought after. Peanut was thrilled with our choice and was on cloud nine the entire time. Upon our arrival, he inspected our room from top to bottom. He called dibs on his bed for the night and then crawled up in it, flipped the tv on and asked for some “Zen” time. Have I ever mentioned that he is 10 going on 60? After some quiet time reading, relaxing and watching a little television, we offered dinner at the hotel. That wasn’t his cup of tea. His choice? The deli next door. He said that if he was going to be in the city, he should eat like he’s in the city. Mom would have preferred something with a little more punch, however it was his night, so deli it was. After that? A little R&R over at Dusk. My husband and I each had a cocktail. Peanut? Chocolate ice cream, complete with blackberries and raspberries. After retiring to our room, Peanut wanted a bath in the palatial bathroom. I filled the tub up so he could play and added some bubbles, courtesy of my now favorite scent in the world, White Tea by Westin(TM). He floated and soaked for nearly an hour before deciding it was bedtime. However, bedtime was him piled up in his bed, watching the Office on TV and giggling his head off. Since that was part of his agenda, Mom took a swim in the tub as well! When we all finally went to sleep, it was the sleep of the dead. We were exhausted from our non-stop travel, but the Westin Heavenly Beds cradled us so sleep was peaceful and we were reinvigorated the next day. My husband is a SPG member, so he collects points on all of his travels with Starwood. We were able to redeem his points for our stay and he still had points left over, which made him happy. 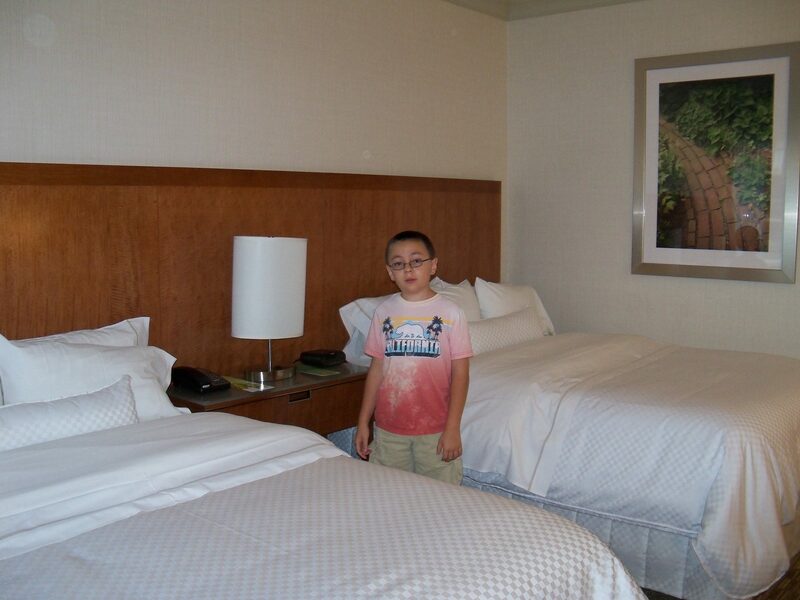 Whenever he travels, Starwood is his first choice and now Peanut can see why: the accommodations are great, the properties have good locations and the service is good. So is our son spoiled by all this? Perhaps a little bit. But the truth is, it’s like my husband says about his travels: “When you’re on the road, away from home, you want to go someplace where you’re confident people are going to take care of you. There’s no point in trying to skimp or cut corners.” And so we did just that.